LAFAYETTE, Ind. 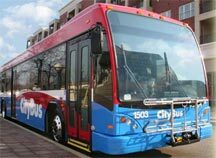 — CityBus will extend service in West Lafayette to the Prophets Ridge subdivision beginning Monday, February 2nd. CityBus General Manager Martin Sennett said Route 5 (Happy Hollow) will provide limited service to the neighborhood near 500 N. and 75 E. in West Lafayette. The bus will serve the neighborhood on four trips in the morning and afternoon. Buses will stop there at 6:15AM, 6:45AM, 7:15AM, and 7:45AM, and at 4:45PM, 5:15PM, 5:45PM, and 6:15PM. Other areas served by the route include Kalberer Rd., Cumberland Ave., Soldiers Home Rd., Happy Hollow Rd., N. River Rd., and the Purdue campus. The ride time between campus and Prophets Ridge is 27 minutes. Sennett said the change includes discontinuing service along portions of the route that are served by other bus routes. “Making the route more efficient is what allows us to extend it further north,” Sennett said. Route 5 will no longer serve S. Grant St., Wood, Chauncey, Salisbury, or Barlow in West Lafayette. Service on Chippewa and Navajo will be provided only when requested by riders. I assume you are referring to economic stimulus funds coming in 2009? The details remain sketchy but we have several projects ready to go including buying new buses and moving forward with improvements to Riehle Plaza’s bus transfer center. Economic stimulus monies cannot be used for operating expenses. For question 2, nearly all buses are wheelchair accessible. We do have a few older buses still in service as back up buses which are not accessible. ADA allows transit providers 30 minutes to provide an accessible ride if a passenger with a disability encounters a non-accessible vehicle, or if there is a malfunction in the accessiblity equipment. This rarely happens anymore. We have used a Federal Grant called Job Access Reverse Commute (JARC) to fund the route 6B extension to Wal-Mart and Benjamin Crossing. Similar grants are being considered to extend service possibly to the Clarian-Arnett hospital, as well as other possible service extensions, or adding night service. 1-I understand that there will likely be funds in 2009 for transportation as well as ADA modifications. 2-Are all of your busses equipped with wheelchair access? Not only would this allow people living in that area to get around and save gasoline but it would allow those of us in the City to get to friends, stores, service providers, family living in that area, etc to be more mobile if we want to save on gas or don’t drive or are handicapped.